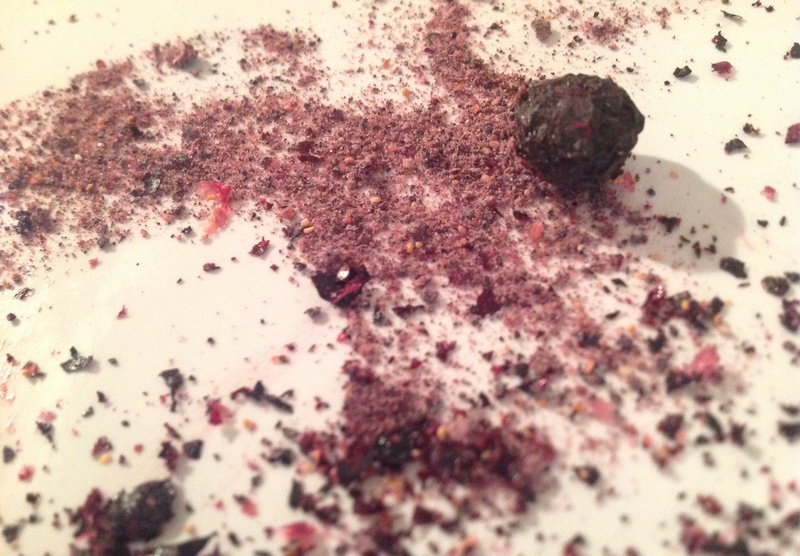 Exploding blueberry dust. | ostrich milk. Study: Blueberry. 3.1.5 Exploding Blueberry Dust. Blueberry pancake breakfast, deconstructed, part 5. Sadly, blueberry dreams deferred do not explode. No matter how hard one tries. However, it is possible to make them fizzle a bit. What if I could make blueberries explode? Could it be possible to embed Pop Rocks — basically, flavored carbonated sugar — inside of a blueberry? What would it be like to spoon a single, apparently ordinary blueberry into your mouth, proudly tongue-squash against your hard palate like too-sweet caviar, only to ignite a surprise series of secondary explosions of tartness and giggles? Yet, the sudden insight was misleading. No matter how carefully the blueberry is cleaned, the liquid inside will quickly trigger the Pop Rocks’ pop. The night was spent in a desperate quest to find some way to insulate the pop rocks from premature blueberry juice detonation. Gelatin failed. Chocolate was just gross. For a few fleeting moments, I thought the solution had appeared. After gingerly releasing the bulb on my pipette to dot a few lonely Rocks resting in a Petri dish with milligrams of agave nectar, for a few hopeful moments, I heard nothing. Then, alas, a faint sizzle of escaping carbon dioxide. I persisted on, even after a good portion of the skin of my right thumb was seared off in a too-intense effort to identify the Goldilocks temperature at which hot blueberry caramel retains enough fluidity to pass through a large-gauge needle, yet is not so hot as to decrystallize carbonated sugar. 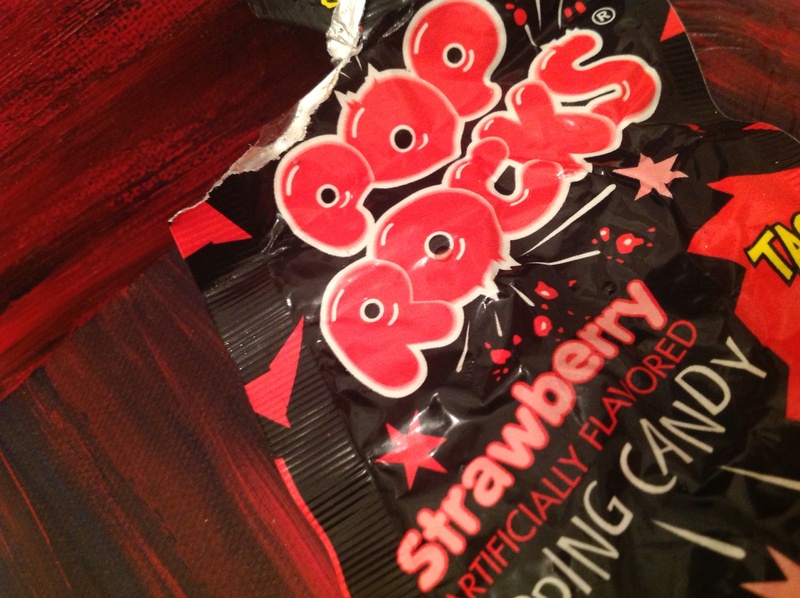 (Pop Rocks are relatively stable in a low-liquid caramel, so long as the caramel temperature is well below the melting point of sugar; however, once the temperature is low enough to not destabilize the Pop Rock, the caramel is left too viscous to inject into a blueberry). Eventually, the moment of resignation arrived. With shame, I embarrassedly adhered some Pop Rocks to the outside of a blueberry with a bit of agave syrup and instructed barbecue guests to close their eyes and pretend. For the blueberry pancake deconstruction, I sought to reclaim a bit of that explosive excitement, even if now but a dry, powdered memory. And a dessert plate needs to be dusted with something, right? Flavor: intense blueberry. Then, a delayed poppiness and citric sour. The dust can be stored for a few weeks in a well-sealed plastic bag in a very cold freezer. .5 packet raspberry Pop Rocks. 1 tbsp. confectioners’ sugar. (The kind that has starch that they don’t tell you about on the label). Pop Rocks drinks and desserts were apparently the thing this summer. Foodbeast had this exhaustive gallery of Fourth of July Pop Rocks recipes. Because carbonated sugar is relatively stable in chocolate, there are many recipes for exploding chocolate available, and even a few commercial products. Confusingly, “Exploding Chocolate” was also the premise of a recently disclosed Nazi plot to assassinate Churchill. 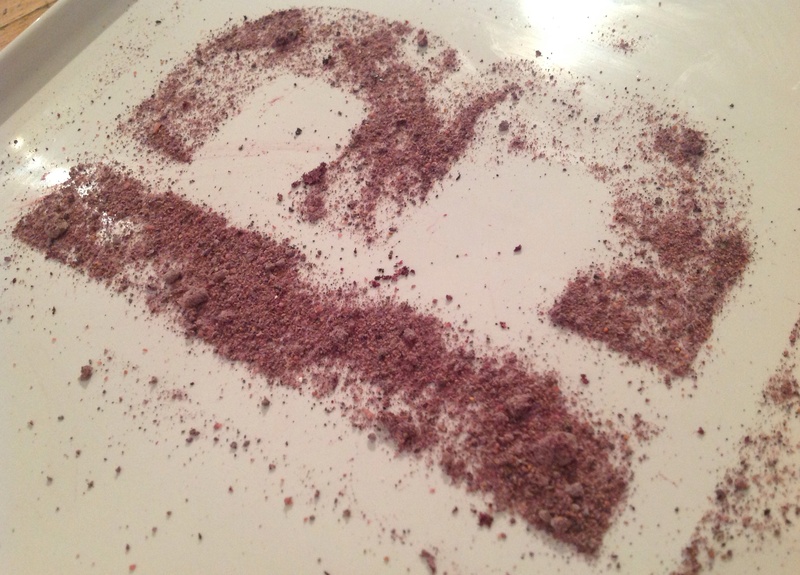 This entry was posted in Blueberry, Studies and tagged blueberry, candied, candy, carbonate, dessert, freeze-dried, garnish, Pop Rock, Pop Rocks, recipes, sugar. Bookmark the permalink.